3.5 out of 5 based on 13 bloggers and 2 commenters. 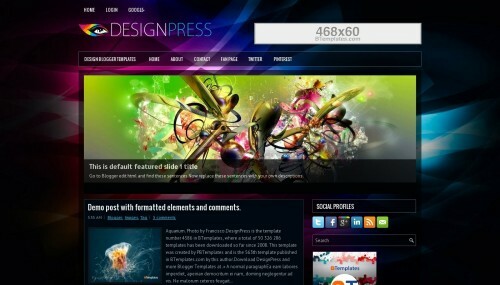 DesignPress is a free blogger template adapted from WordPress with 2 columns, responsive design, right sidebar, fresh look, ads ready, footer columns, slider, social bookmarking icons, posts thumbnails, tabs, abstract, geometric motifs and gradients. Excellent template for blogs about art, fantasy, fashion, movies or music. Thanks for this creating. It’s really nice. I have download it. I love the basics of the design, but I have tried to change it to my liking, and its simply too timeconsuming to set up. I’ve tried to change the background several times, but to perform just a simple task like that has not yet been succesful. SO – in order not to waste my time on design, when I want to write – I quit it. I have changes a lot of designs from blogger since 2010, but this is way too time consuming.